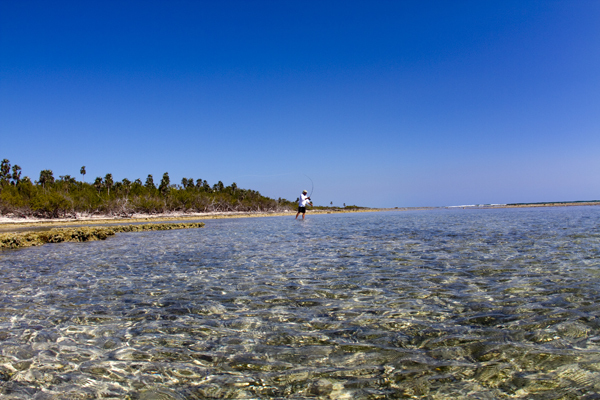 Greg casting for bonefish in the shallows. Photos by David Lansing. It is funny about fishing. There are days when the conditions are perfect—the proper tides, no wind, the fish easy to spot—and yet you catch nothing. The ocean just goes quiet and there’s nothing you can do about it. The good guides, like Keko, take fishing as personally as we do and on those days when nothing happens they feel as if they have let you down, as if, for some reason, it was their fault that the fish did not come. “I am sorry, my friend,” Keko will say when we get back to the Avalon, sheepishly looking down as he mops up the salt water that has slopped into the skiff. Then I will put my hand on his shoulder and tell him, no, he has nothing to be sorry for, that the day was as beautiful as any day we have ever fished and just to be out on the water and see the osprey diving and the turtles rising to the surface next to the boat was as fine as it could be and it was just bad luck that we could not find the fish. Certainly they were out there somewhere, just not where we looked. And then there are days like yesterday. It is a mystery how the guides know where to go every morning. I have talked to Keko about it and he has told me about the tide going in or out, about the clouds in the sky and whether the wind is coming from the south or the north, but it is still a mystery. It is just that they have spent so many years out here in the mangroves and islands of the Jardines de la Reina that they can tell you, almost to the day, when the tarpon migration has begun and where the schools of very large bonefish, many over five pounds, are running, and where the permit are sucking on small crabs on the sandy bottom. It is a mystery, a wonderful, wonderful mystery and I would give anything to speak the language of the Jardines the way they do. Last night at dinner, Idelvis, who we call Elvis, told us that there would be winds in the morning but it would be calm by noon so it was best if went diving first and then fishing mid-morning. Because of an ear problem I do not dive so I slept in a bit, enjoying the morning and my solitude on the boat, reading a bit and drinking my coffee. Around eleven, everyone else came back to the boat. They were excited from their dive. They’d seen many lemon sharks and large rays and some cubera snappers that they said were easily over a hundred pounds. Keko, the Cuban Buddha, poling in the shallows. But now, just as Elvis had predicted, the winds had died and we were all anxious to go out fishing. Again Greg and I were the first to be ready and we commandeered Keko and were off while the others were still scrambling to find their gear and change out of their wetsuits. Every day fishing is different. Sometimes you might run along the shoreline that ends in the point with the lighthouse and sometimes you zig and zag through the mangroves looking for a particular backwater, but this morning we went out past the reef into the deep water that is almost the dense color of India ink, and ran south, parallel to the shore, for almost twenty minutes. Suddenly Keko slowed the skiff and pointed the boat towards the shore, killing the engine once he saw the turtle grass beneath us. The water here was no more than two feet deep. 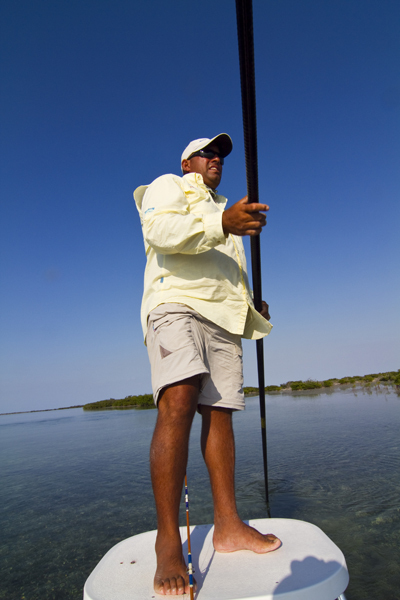 As he started to pole the skiff in the shallow water, Greg pulled his bonefish rod out of the holder on the side of the boat, but Keko told him to wait. He poled for a good ten or fifteen minutes, us just sitting in the boat looking closely out over the water through our polarized glasses, hoping to pick up the dark shapes of bones or see their silver fins roiling in the water. We saw nothing. Usually in a situation like this the other person would stop casting for fear of fouling their line with the running bone, but Keko told me to cast again and when I did, I hooked up as well. We both had bones on the line, running in opposite directions, the line singing and us playfully admonishing the other to stay out of our way. Greg brought his in first and, as Keko had said, it was a good-sized bone, at least five pounds. Mine was just as big. For the next two hours we stayed in the same place, both of us fishing at the same time, which is always a joy, and in the end, Greg caught eight bonefish and I brought in six. We had lost just as many. We were both so exhausted from the constant casting that when it was over we just sat in the boat breathing heavily and drinking cold Cristals and not talking. Keko was laughing at us. “Good fishing?” he asked rhetorically. “The most amazing fishing ever,” Greg said. And he was right.